ESTABLISHED IN 2003,TONGLI ELECTRIC APPLIANCE CO.,LTD IS A PROFESSIONAL MANUFACTURER OF VARIOUS HOME APPLIANCES,OUR FACTORY IS LOCATED IN CIXI CITY ,ZHEJIANG PROVINCE,NEAR TO BEILUN HARBOR ,WHICH IS ONE OF CHINA'S LARGEST EXPORT DOCKS.AS WELL AS AN INTERNATIONAL AIRPORT.TAKING ADVANTAGE OF TRANSPORTATION SERVICES OFFERED BY THESE FACILITIES,WE CAN SHIP ORDERS SOON AFTER CONFIRMATION BY CLIENTS. 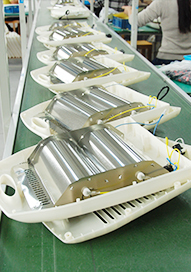 WE HAVE MANY YEARS' EXPERIENCE IN PRODUCING HOUSEHOLD ELECTRICAL APPLIANCES WHICH QUALIFIED FOR CE.ROHS,GS,LFGB,ETC APPROVALS.FOR HAVING ADOPTED TECHNOLOGIES INTRODUCED FROM REPUTABLE SUPPLIERS BOTH AT HOME AND ABROAD,AMD INTRODUCED 160 SETS OF LATEST MACHINES ,CURRENTLY WE CAN MANUFACTURE VARIOUSPRODUCTS TO MEET CUSTOMERS DIFFERENT REQUIREMENTS . OUR MAIN PRODUCTS INCLUDE FAN ,HEATER ,WATER DISPENSER ,COFFEE MACHINE ,WIN COOLER. WE HAD BUILT TRADE RELATIONSHIP WITH MANY CORPORATIONS AND INDIVIDUALS.OUR PRODUCTS SELL WELL IN WORLDWIDE MARKETS FOR OUR PROFESSIONAL DESIGN,GOOD QUALITY ,COMPETITIVE PRICES AND PROMPT DELIVERY ,ESPECIALLY FOR OUR EXCELLENT AFTER -SALES SERVICE.OUR COMMITMENT TO QUALITY MEANS THAT WE HAVE ALWAYS BEEN RREADY TO INTRODUCE THE LASEST TECHNOLOGY ,PRODUCTION EQUIPMENT,AND TECHNIQUES,MOREOVER,WE ALWAYS SEEK TO HAVE AMONG OUR STAFF EXCELLENT PERSONNEL WITH SEASONED AND RESPONSIBLE MANAGERS GUIDING THEM. ADHERING TO THE MANAGEMENT PRINCIPLE OF "SUPPLYING CUSTOMERS THE BEST PRODUCTS".WE CARRY OUT A STRICT QUALITY CONTROL SYSTEM TO ENSURE PRODUCTS QUALITY .WE ARE DOING OUR BEST TO ACHIEVE 100% CUSTOMER SATISFACTION DEGREES.IF YOU ARE INTERESTED IN ANY OF OUR PRODUCTS.PLEASE FEEL FREE TO VISIT OUR WEBSITE OR CONTACT US DIRECTLY FORE MORE INFORMATION.WE LOOK FORWARD TO COOPERATING WITH YOU IN THE NEAR FUTURE,AND OUR PROFESSIONAL TRADING TEAM IS STANDING BY TO DEAL WITH YOUR INQUIRIES AND PRODUCT FEEDBACK.